Fix the Fells is up for £25k funding from the Aviva Community Fund – but we NEED your votes now to win it. Please VOTE NOW here. You need to create a free account and register your email first, and then you can submit up to 10 votes for our project. Thank you so much for your support. Scafell Pike is England’s highest peak. It is an iconic mountain. It is a magnet for walkers, climbers, challenge participants and tourists. And for almost 100 years it has been a war memorial for the nation – a special place to remember the fallen heroes of the First World War. Almost 100 years since the mountain was gifted to the National Trust after the end of the First World War, Scafell Pike remains a much-loved place. But is it being loved too much? The sheer numbers of visitors, along with severe weather events, are putting the mountain under increasing pressure. Erosion is a constant problem. As the path grows wider, soil washes away and the fragile mountain habitat is damaged. But you can help. 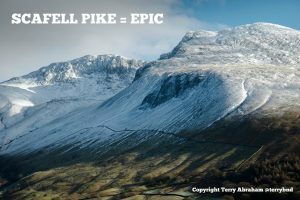 Vote for our campaign now and help us preserve the beauty and serenity of Scafell Pike for the next 100 years. Your votes will help us win funding to employ a new seasonal ranger in 2018. This extra pair of expert hands will enable us to carry out much-needed repair work to sections of the popular Brown Tongue and Hollow Stones routes to the summit – paths used by an estimated 100,000 people every year. We will also be able to buy new equipment and tools and pay for the expenses of our incredible volunteers. removing ugly erosion scars that can be seen for miles, preserving the habitat of rare mountain plant species, and improving water quality by reducing sediment run-off. Scafell Pike is a special place. It is a mountain worth protecting – please vote for our project now here.